Sturgis Buffalo Chip, South Dakota (September 6, 2012) The Sturgis Buffalo Chip® was the site for the annual Sturgis Rider® Sweepstakes where one lucky winner received a custom Victory Cross Roads motorcycle and Epiphone Coronet guitar. The Sturgis Rider® Sweepstakes winner’s name was announced live on the main concert stage at the Buffalo Chip during the Sturgis Motorcycle Rally on Friday, August 10, 2012 prior to the headlining performance by Slash. More information and registration for the 2013 Sturgis Rider® Sweepstakes with its one of a kind prize package that combines the world of music and motorcycling will soon be available at www.BuffaloChip.com. The capacity crowd in the Buffalo Chip’s natural amphitheater was treated to an exciting night when the 8 finalists of the Sturgis Rider® Sweepstakes took the stage to cheers from the audience. One name was drawn at random from the list of finalists. The winner was Mr. Ian Sherwood of Wood, SD. Mr. Sherwood, an avid motorcycle enthusiast, had earned his randomly chosen spot in the finals by registering for the Sturgis Rider® Sweepstakes. This year’s sweepstakes registration was collected online at www.BuffaloChip.com, live at the Gibson tour bus at The Chip during the Sturgis Motorcycle Rally, and via QR code scans that were available on Pepsi cans and at in-store promotions leading up to the rally. 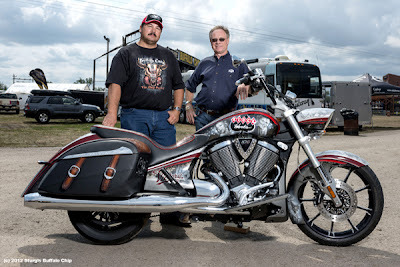 The Sturgis Rider® Sweepstakes prize package included a one of a kind custom Victory Cross Roads motorcycle named “Kountry Wild” by Klock Werks Kustom Cycles. The one of a kind creation featured Renegade wheels, high output Kicker sound system, hand tooled leather from Duane Ballard of DB Leather, detailed paint and airbrush work by Darren Wenzel of Gasoline Art, floorboards from Strokers Dallas and fenders, handlebars and fabrication by Brain Klock of Klock Werks. Also included in the prize package was a custom Buffalo Chip Epiphone Coronet guitar. Introduced in the early 1980s, the Epiphone Coronet remains a favorite with musicians today. Both the bike and guitar are custom classics that will help commemorate Ian Sherwood’s 2012 journey to the Black Hills and the Sturgis Buffalo Chip®. "The whole thing was unreal, I still can't believe I won," says Ian Sherwood, winner of the Sturgis Rider Sweepstakes. "I have been coming to the Buffalo Chip for years with my wife, Dori, and have entered the sweepstakes before. This year when I got the call that I was a finalist, I just said “No Way!” When we were all on stage looking out on the huge crowd, I just knew I wasn't going to win, but it was really cool being on the stage like a rock star or something. Then when they called my name as the winner I didn't know what to do. It just happened so quickly, it was unreal. Sitting on the bike, being handed the guitar, then having all the photographers surrounding me with the crowd going crazy, it was just amazing. You can bet we will be back at the Chip next year and every year to enter the Sturgis Rider Sweepstakes again. Thank you Victory, Epiphone, Klock Werks and most of all the Buffalo Chip for making this all happen." 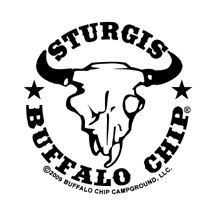 About The Sturgis Buffalo Chip- Sturgis Buffalo Chip® 2013 will take place August 2nd – August 11th. The Largest Music Festival in Motorcycling™ and the Sturgis Rally’s cornerstone event will celebrate its 32nd consecutive annual concert series at their famed camping resort. Since 1982, the Sturgis Buffalo Chip® has provided unforgettable live music experiences and exciting activities for fans from around the world. The Sturgis Buffalo Chip® attracts the music industry's hottest stars and emerging talent and hosts a diverse selection of food and beverage vendors and interactive exhibits. Set on 580 acres, three miles East of Sturgis, the Buffalo Chip® is a festival experience like no other. More details are available at www.BuffaloChip.com .